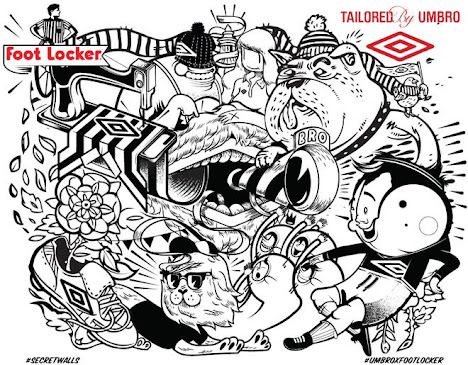 Fashion, Art and Music – they are never far apart and none closer than the launch of a brand new collaboration between Umbro and Foot Locker. To celebrate the exclusive collection, available from Foot Locker nationwide on the 5th November, the two giants of street culture are on the hunt for Europe’s best underground artists. In partnership with Secret Walls, a team of established artist, including Riff, Conzo, ALPHA and McBess, has been assembled to help launch the career of one aspiring artist. Now open for entries, anyone with a talent for free drawing, illustration, graffiti and design can enter at www.facebook.com/umbro. Here you’ll need to upload your best artwork influenced by football culture. The mechanic is simple, upload your work in the allocated Facebook tab and you are in the running. Four up-and-coming artists will then be shortlisted to take part in a live battle at East London’s Book Club on the 25th October. Each artist will have a helping hand from one of Europe’s illustration elite to guide and advise them while they battle it out in front of a 400 strong crowd. If that wasn’t pressure enough the whole event will be streamed live at www.facebook.com/umbro. Watch the teaser video above and if you still think you’ve got what it takes then head to www.facebook.com/umbro and enter before the 17th October closing date.